Khachaturian finally completed his ballet Spartacus on 2 February 1954. The first public announcement of the project was made on 29 December 1940 in the newspaper Sovetskoe Iskusstvo [Soviet Art]. However, the music was written between 1950 and 1954, with most of the work taking place during summer months at the composer’s retreat in Staraya Ruza. The original idea for the ballet was the creation of the critic and author Nikolai Volkov in 1938. Volkov based his version of Spartacus on the accounts of two ancient historians, Plutarch and Appian. This was then embellished to include the characters of the sly Aegina and the treacherous Harmodius. The story, set around 74 to 71 BC, concerns the fate of Spartacus, a rebel slave, who leads a revolt against his Roman captors, only to be betrayed by a number of his followers and brought down. 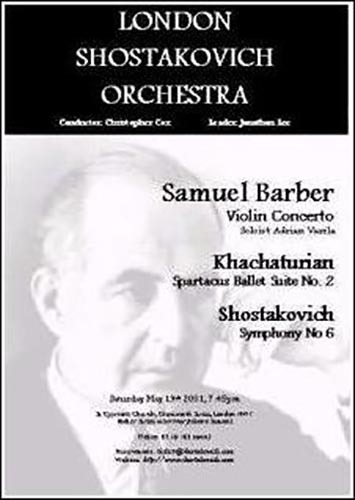 When Volkov approached Khachaturian with the idea of creating a ballet on the story, the composer was concerned about the theme as it was set in antiquity – his previous ballet successes (Happiness and Gayane) had been set in modern times. Volkov nonetheless persuaded Khachaturian that a ballet on the subject of a slave uprising would be ideal, writing in the corner of the score `with this you shall succeed’. Written the same year as tonight’s symphony, Samuel Barber’s Concerto for Violin and Orchestra was commissioned in the spring of 1939. Barber’s status as an international composer had been confirmed a year earlier after Toscanini and the NBC Symphony Orchestra had broadcast, among other works, his hugely successful Adagio for Strings of 1936. After this point almost all of Barber works were commissioned. It was the industrialist Samuel Fels who commissioned the Violin Concerto for his adopted son, the Italian prodigy Iso Briselli. Briselli was, at that time, a student at the Curtis Institute of Music – the institution largely responsible for Barber’s musical education and in which, from 1939 to 1942, Barber taught composition. 1937 saw Shostakovich’s `practical creative reply to just criticism’ in the form of his Symphony No. 5. In the wake of the Pravda article `Muddle Instead of Music’, the première of the Fifth Symphony was a sensation (with a thunderous ovation lasting half an hour) – not only was this a work that could secure the composer’s rehabilitation, but also a legitimate channel for grieving at the zenith of the Great Terror of the 1930s. In September of the same year Shostakovich began teaching composition at the Leningrad Conservatoire. This, together with the immense relief after being rehabilitated, halted any major creative work for almost two years – the period between 1937 and 1939 saw the composition of a number of film scores, a second Jazz Suite, and the First String Quartet. It was the Sixth Symphony that signalled the end of this creative drought. The successor to the hugely successful Fifth was originally publicised as a `Lenin Symphony’ – a monumental work employing soloists, chorus, and orchestra, setting, among other things, Mayakovsky’s poem `Vladimir Ilyich Lenin’. Yet by January 1939, when Shostakovich was preparing to write the long-awaited symphony, no mention was made of Lenin or a text, or soloists and chorus. Instead the composer produced a purely instrumental work in an unconventional three movement form, with an opening Largo of greater duration than the following Allegro and Presto put together. As Glickman recalls, the première was a huge success with the Finale being encored. Yet the critical reception was not so enthusiastic. Critics were uneasy with the lop-sided three- movement structure and, as Boris Schwarz reports, `the inner contrast between the philosophical subjective beginning and the extrovert, flippant ending seemed too sharp.’ With the patriotic works by Prokofiev and Shaporin overshadowing the Sixth Symphony, perhaps the failure of Shostakovich to produce a Lenin Symphony contributed to the cool critical reception. On 21 November 1939, exactly two years after the première of the Fifth Symphony, in the same hall (the Large Hall of the Leningrad Philharmonic), with the same performers (the Leningrad Philharmonic Orchestra under Yevgeni Mravinsky), the Sixth Symphony was unveiled to the public. Part of the `All-Soviet Music Festival’, Shostakovich’s symphony shared the stage with such patriotic works as Prokofiev’s Alexander Nevsky and Yuri Shaporin’s On the Fields of Kulikova, together with Myaskovsky’s symphonies nos. 19, 20, and 21 and Khachaturian’s Violin Concerto.